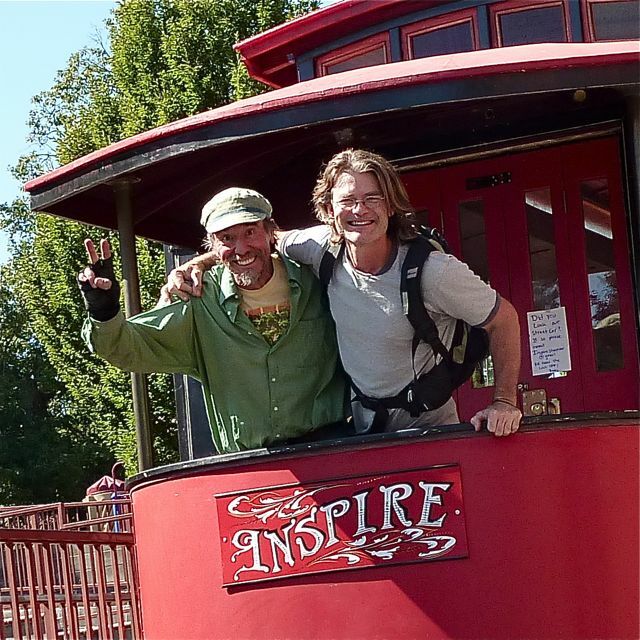 Jim Young and Marcus Scott hanging out in the Streetcar Named Inspire. The streetcar will be part of Holiday Market this year at the Briscoe ArtWing. As the Winter Solstice approaches we long for the familiar comfort of friends and family. The days grow short, the nights long. The shadows of winter are perfect for reflection, contemplation, tending to the internal, keeping our homes aglow as the light of the sun dims, the light from within shines through. As we ready ourselves for the slow pace of January, December is our time to draw together in celebration, love, and honor of that special time when all the worlds cultures huddle close together to stay warm, to share our light, thoughts, food, our creations, and the continued bounty from a plentiful harvest. Familiar sounds, textures, and images bring us comfort and help us feel at home. Cozy is the word that comes to my mind. The Briscoe ArtWing Holiday Market is one of the most cozy shows I do all year. It feels like an extended family get together, but without all the drama so often associated with the nuclear family gathering. We gather one last time before the New Year to share songs, art, craft, and fellowship. Hopefully, we also earn enough to make it through the sparse winter months. For the typical artisan the holiday season is the last chance to squirrel away enough nuts to make it through the winter. 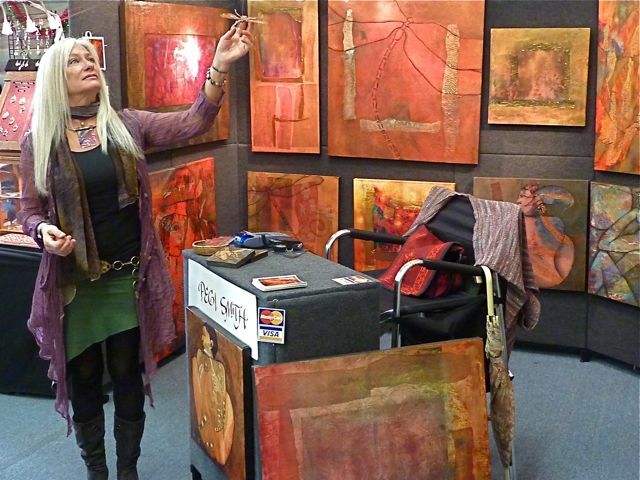 Abstract artist Pegi Smith will once again be at the Holiday Market at the Briscoe ArtWing. The 2011 Holiday Market will be open four weekends this season. Starting First Friday, December 2nd, and continuing through the weekend, the Market will take place every weekend leading up to Christmas, including Thursday December 22nd, Friday the 23rd, and Saturday the 24th — Christmas Eve. The market will be open Saturdays from 10:00 – 6:00, and Sundays from 11:00 – 5:00. I have often been asked by fellow artisans why we don’t remain open right up until Christmas Eve and take advantage of our shared space at the old Briscoe School. Well, this year we will do just that. The hope of this experiment is to offer the community another opportunity to purchase gifts from local artisans in lieu of the big box options that have come to dominate our shopping experience, especially last minute shopping. Now you have until the last minute on Christmas Eve to buy local. Trust me, there is nothing sacred in the experience of scrambling for a last minute gift at Walmart. However, you just might find that perfect soulful creation right up to Christmas Eve at the old Briscoe Elementary School, 265 North Main. Buy local because it makes a big difference on many levels. Putting money into your local economy keeps our community strong, healthy and prosperous. Nothing is more economically important in times of perceived scarcity. Keep the circulation of resources as local as possible. 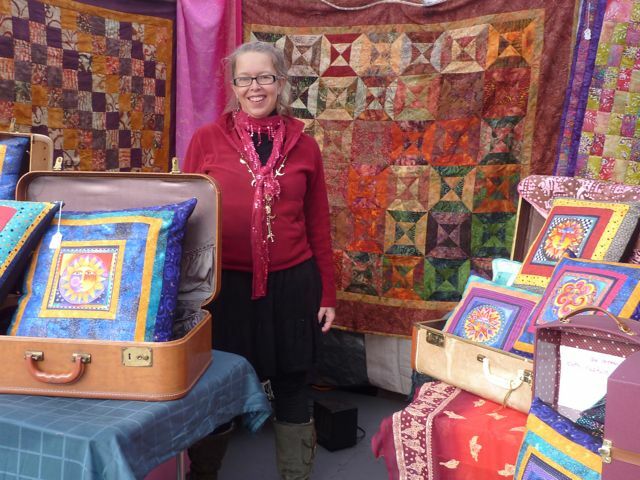 Kris Daly in her booth at Holiday Market at the Briscoe ArtWing. The Briscoe ArtWing comes to life for the entire month of December with a diverse feast of art, craft, music and merriment. All of the studios at the ArtWing are participating in this years event. This is your chance to see what is going on in the old Briscoe Elementary School. The working artisans are attempting to reestablish the ArtWing as a school to teach the kids of Ashland arts and crafts. Additionally, 4 percent of all purchases goes back to the Ashland School District. Buying local keeps your money circulating within the community, and the artisans give a portion of the sales back to the schools. Your dollars have double the impact on our local economy, education, and community. Live music is scheduled for every day of the event. The show opens First Friday, December 2 from 5:00 – 8:00 pm with a Marimba Concert happening in Studio 2. Local musicians will entertain daily filling the hall with familiar sounds (see the music schedule below). I am inspired by my musically gifted friends and find comfort in their voice, their strumming, their tunes. When the old hall at the ArtWing is full of artists, and the place is humming with original songs from our talented friends, I feel at home, nurtured, and comfortable. We all come in from the cold and through the exchange of our shared talents we bask in the glow of our internal furnaces. Coming together as community during the holidays gives me the same warm feeling I remember as a kid acting out the Christmas story at my Church. I recall always getting the part of the Roman soldier, or the shepherd. The point is we shared a familiar story, then followed that with songs, and finally we shared food. Coming together in a safe, comfortable space and sharing — that is what made the event special, and those images are strong memory medicine for me today. As an adult my most intimate community images are the time we spend together sharing our art, stories, and music. As an artisan I tend to play the role of the hermit, engaged in my shop with buckets of stones. I am at home, but not in a place where I get to share and interact with my community. We can create all we want in private; however, the satisfaction of creation is far more gratifying when we are able to share those creations with our community. The Holiday Market at the Briscoe ArtWing turns that idea into reality. 30 local artisans will display their art and craft each of the four weekends of the Holiday Market — jewelry, fine art, woodwork, clothing, hand stitched leather boots, English toffee, and much more. When I think of local music that brings me joy, I think of Craig Wright. Craig is an old friend of the market and his playing for Holiday Market has become quite the tradition. He plays December 11th from 3:00 ‘til 5:00, and again on December 17th from 3:00 ‘til 5:00 . As much as I enjoy sharing my stone beads with my community, I equally love to hear the voice of talented friends. Local musical hero Gene Burnett will come by to sing us his songs, Cole Cullen will play a set of originals, and Marcella Ruikis will be accompanied by Jim Quinby on the piano. Aaron Reed brings his songwriting talent and soulfully charged voice to the hall on two occasions. Great, locally crafted music, original art and craft, and community coming together to share the light of our collective energy. What better way to honor the holidays than the manifestation of our own traditions that we create as we go. I cannot think of a better way to say goodbye to 2011 than spending time with friends and family. Hope to see you all at the market. The event is free to the public. 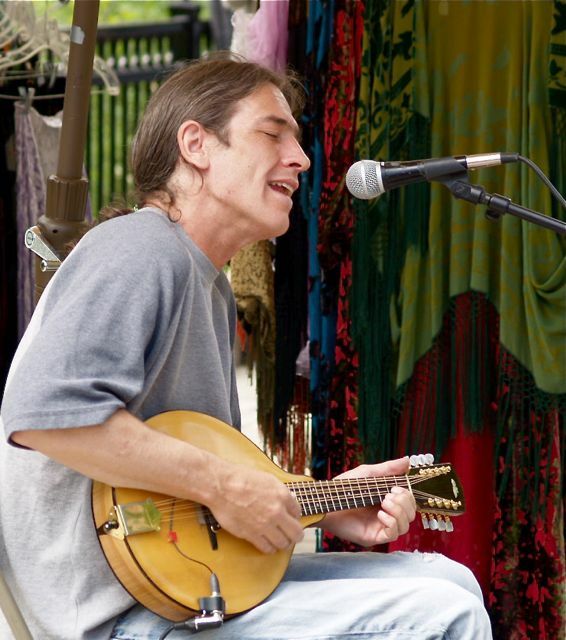 Local favorite Craig Wright brings his musical talents to Holiday Market on December 11 and again on December 18. Wow! The whole month of December celebrating, shopping, and soaking up beauty, art, music, and Ashland community at the Briscoe ArtWing. YUMMEEEE! © 2006 -2011 LocalsGuide LLC - Shields Bialasik - All Rights Reserved.